This is one of my favorite smoothies. You can leave out the honey if your bananas are very ripe and sweet but I love the combination. A fairly healthy frozen dessert treat! Great with leftover, cooked and diced chicken. Not as high-fat as other versions of mac and cheese, but only eat in moderation! This is a combo of my Chicken Pot Pie filling and my mother in-law's Biscuit Style Crust. They go together fabulously. This is awesome with a double crust, but if you are watching your fat intake, it is also yummy with just a top crust. Also, the homemade gravy is wonderful, but if you have leftover gravy or prefer to use canned or jarred, this is even easier. Enjoy! Mix it up the night before and heat it in the morning! Yummy breakfast with fiber & protein! Virtually Fat Free, 55 calorie CHOCOLATE COOKIES! Guiltless Chocolate Cookies & IBS Safe! This is my almost-daily mid-morning snack. This is a family favorite that I miss. You can cut calories/fat by using super lean meat & light cheese. Peach Yogurt & Apples make this a great breakfast! 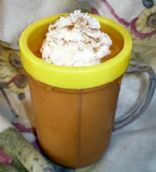 Get you protein in with this delicious meal replacment shake! Dried Fruit and Walnuts enhance this breakfast staple! Like Banana Bread in a Bowl! Low Fat, Filling & loaded with protein & fiber! Oats, Raisins, Cranberries & Walnuts! I made this up this morning because I was in the mood for something a little different. Get some protein & fiber plus low-fat!